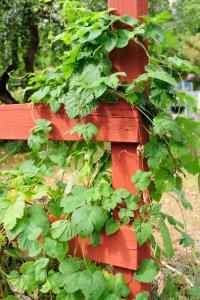 Hops are perennial vines traditionally grown for the purpose of flavoring beer. The female flowers of the plant, which resemble tiny, papery pinecones, have been added to beer for centuries and are responsible for the tangy, slightly bitter flavor adored by beer aficionados. Hops should be planted in rich, well-drained soil in a location with at least six to eight hours of direct sun each day. They are a long-lived perennial, so it pays to generously amend the soil with compost at planting time, giving the vines a long-lasting supply of nutrients. The vines are tuberous and are typically planted when dormant in late winter when the rhizomes are available from mail order nurseries. After amending the soil in a circular area several feet in diameter around the planting location, plant the rhizomes horizontally about one inch below the surface of the soil. The vines are drought tolerant once established, but thrive on a weekly irrigation regime. Spreading several inches of mulch over the root zone each year will help to keep them from drying out and contribute to rich topsoil as the mulch breaks down over time. 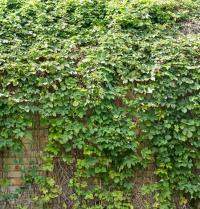 Once they get going, hop vines grow to massive proportions. 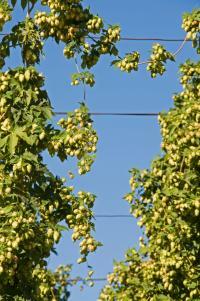 After a few years of building up their root system, hops can grow 30 feet or more from the ground in a single season. The vines are not woody, but consist of only lightweight tendrils, so they don't need as sturdy of a support as plants like grapes or wisteria. They can be trained along a fence, up a wall, over an arbor or on a free-standing trellis. Any type of support will work as long as there is something for the vines to twine around - just be sure to give them plenty of space. They will invade trees, gutters and house siding, so it is best to keep them away from these objects or be prepared for constant maintenance to curb the voluminous growth. The primary task involved in growing hops is to cut the vines to the ground after the first hard frost in fall. The leaves turn brown and hang on the vines through the winter, looking very unkempt - and the plants resprout from the base anyway - so it is best to cut them back completely rather than let the dead foliage accumulate. Extracting the massive vines from the trellis can be a significant project, but fortunately there is little else in the way of care required by hop vines. Occasionally, aphids, mites, and mildew can be a problem. The first two are tiny sap-sucking insects that are easily sprayed off with a strong blast of water from the hose or killed with an insecticidal soap. Mildew is most common on hops in cool, damp regions and is exacerbated by sprinkler irrigation that keeps the foliage wet. Water hops at ground level as a preventative measure and, if necessary, use a commercial fungicide to keep the mildew under control. 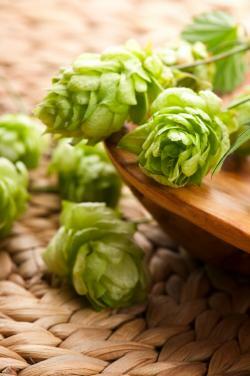 Hops have inconspicuous green flowers in early summer that develop into the papery cones - essentially the fruit of the plant - by late summer or early fall. Let the cones dry on the plant, picking them just as they begin to lose their bright green color. Place them on a flat screen in the shade to dry slowly for a few more days and then store in sealable plastic bag or mason jar until ready to use. 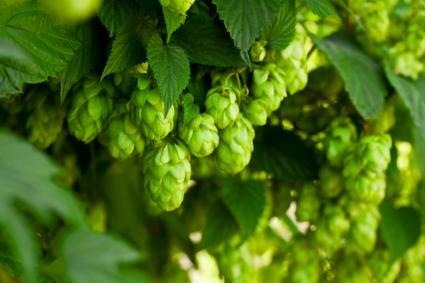 Whether you want to grow hops to brew your own beer or just as an interesting botanical specimen, the deep green foliage and tender, twining vines make it a subtle, but magical addition to the landscape.